You are currently browsing the category archive for the ‘SeaBell’ category. 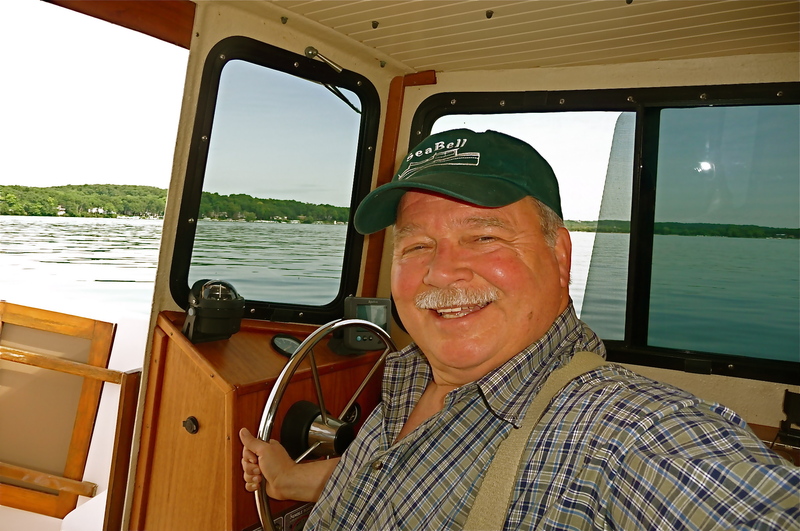 My trusty pocket trawler headed home to the barn from the sunny shores of Williams Bay on Geneva Lake, Wisconsin, just a few years ago. Yesterday and today were the first two days of their kind, beautiful placid days on Geneva Lake, when I’ve not felt guilty for not taking the boat out. 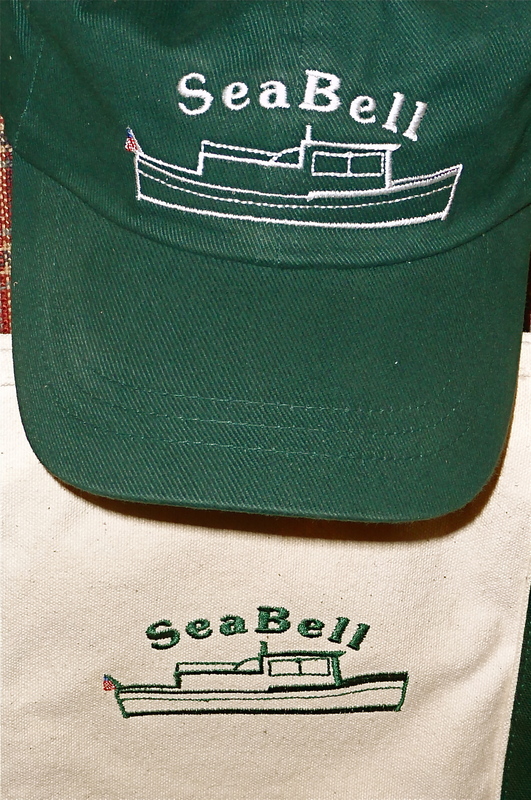 We sold the SeaBell to another enthusiast on Saturday. Now I’m left with the memories, the hand-plaited rope bell pull, the French signaling horn, the 50-year-old log book, and hundreds of photos, some framed, some in flip-cases and many on the computer, of every inch of SeaBell and some of our outings. I want to think about other boats whose decks I yearn to walk, but push away. It’s too soon. The funds raised from SeaBell will go to support my college cause-related communications awards program for a few more years, so I’m sure I’ll be reminded of her whenever the award ceremonies come around. 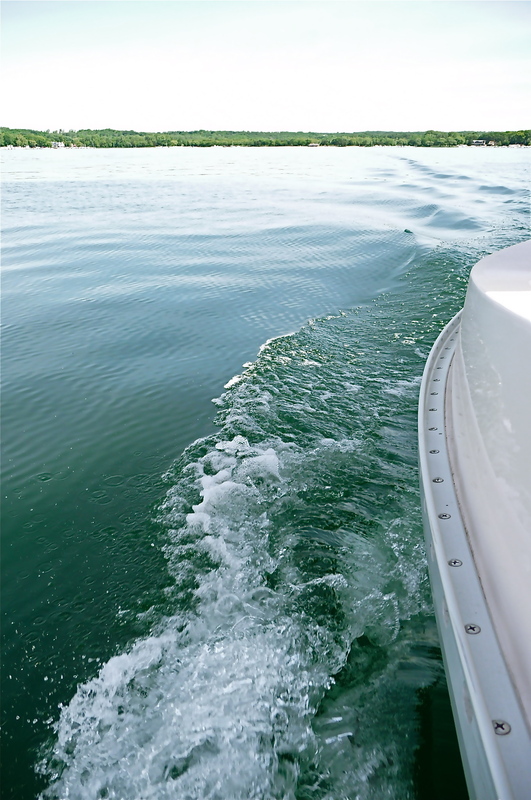 Always liked the feeling of knowing I had a boat on the lake, whether I was aboard her or not. Now I’m not sure what to think. 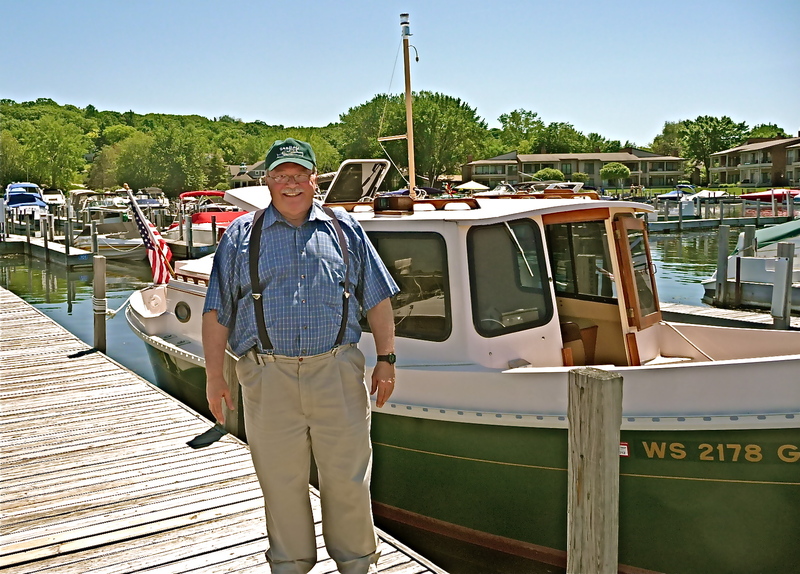 after 8 seasons aboard the sturdy little SeaBell, as Vicki and I walked away from the dock at Gage Marine on Williams Bay at Geneva Lake, Wisconsin this morning, leaving the new owners, Steve and Laura, aboard to enjoy their new pocket trawler and make plans for the future. 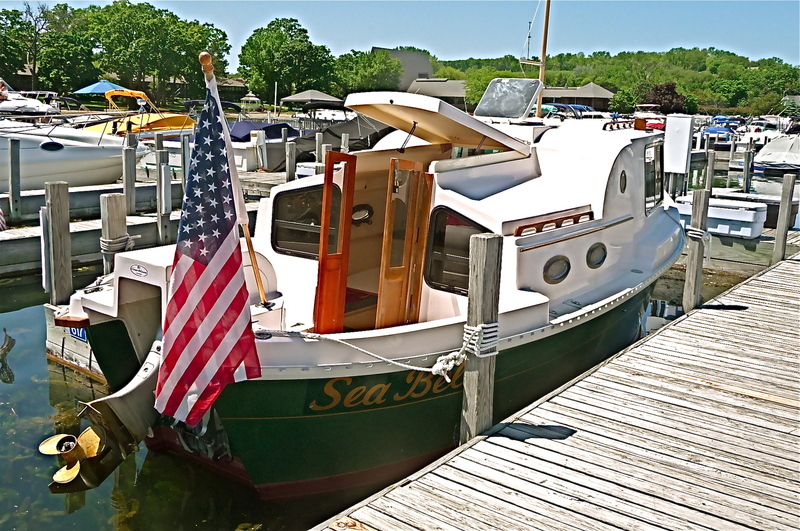 Just sold the SeaBell this morning to a fellow who will cruise her on the Illinois River, who fell in love with the Nimble Nomad boat while chartering one recently for a cruise on the Erie Canal. 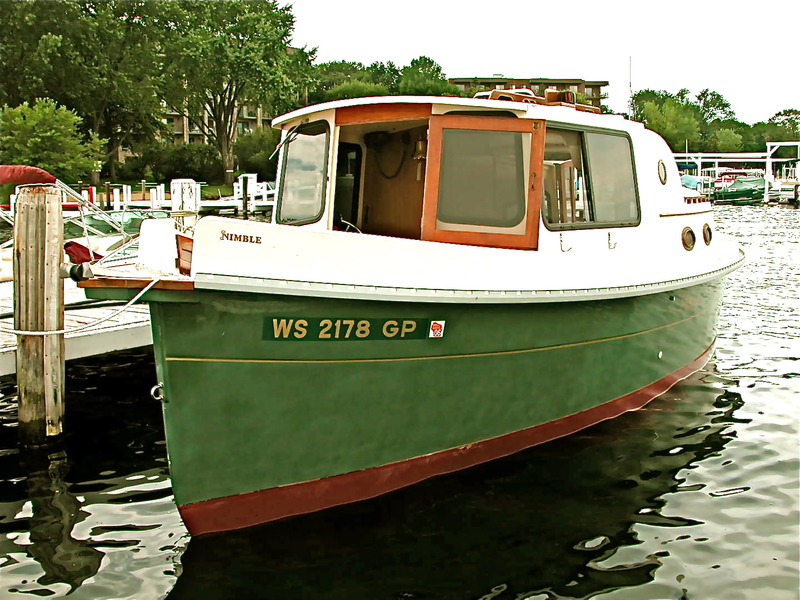 of the pocket trawler SeaBell, now for sale at Geneva Lake, WI. Complete, ready to go, trailer included. Contact me for details. Geneva Lake in all it’s splendor…. Looking east from village of Fontana. Como lake to the north. City of Lake Geneva around bend to left at top. Williams Bay midway on north. Yerkes Observatory just west of Williams Bay. No need to invest six figures to own a bristol condition small trawler yacht, known as a pocket trawler. For the price of an open boat own a little yacht. 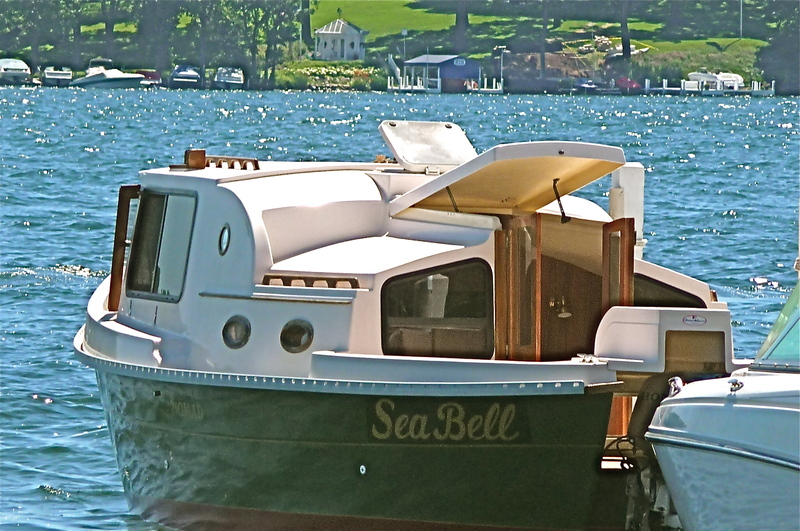 The SeaBell was built by Nimble and is a 1995 Nomad model. Just under 25 feet, easy maintenance fiberglass with wood trim. 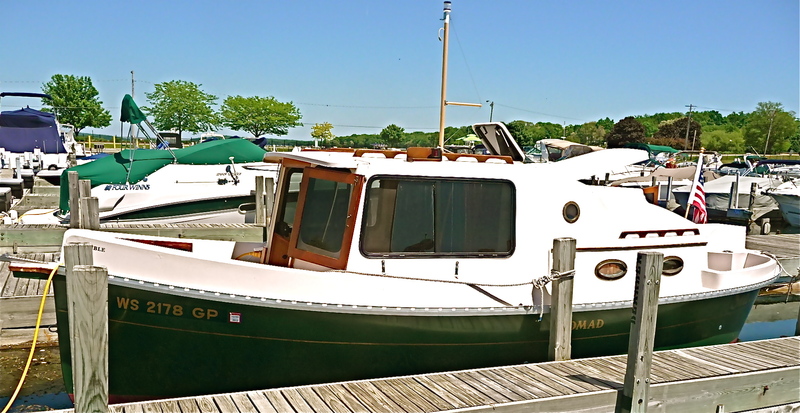 For more info on these character boats, Google Nimble Nomad. Newly available, ready to go, detailed and in excellent condition. Has 50 hp, four-cycle Honda engine with very low hours, mobile with custom two-axle trailer, fully equipped. 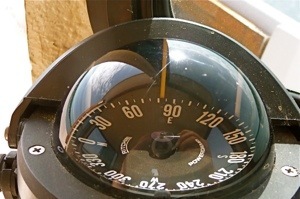 Ideal for cruising, fishing or just lolling on lakes, rivers or inland waterways. Quiet, slow (8mph), comfortable, economical on gas. Perfect for single handing, a couple or small family. 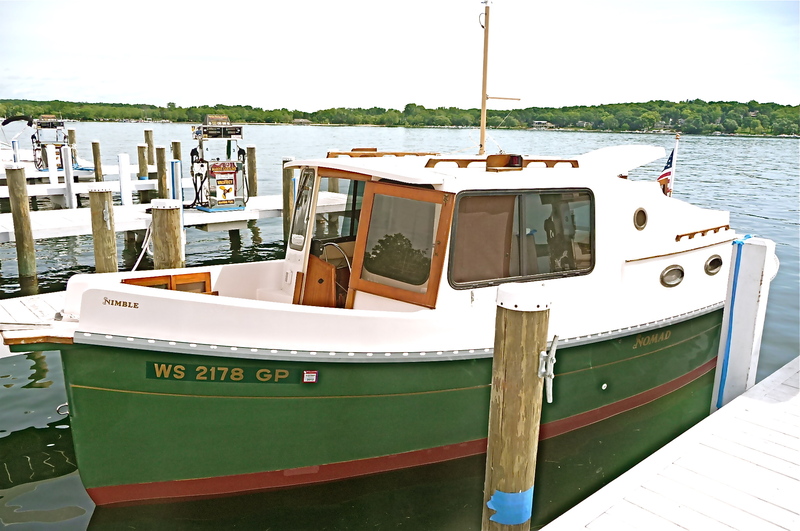 Day trips or live aboard. 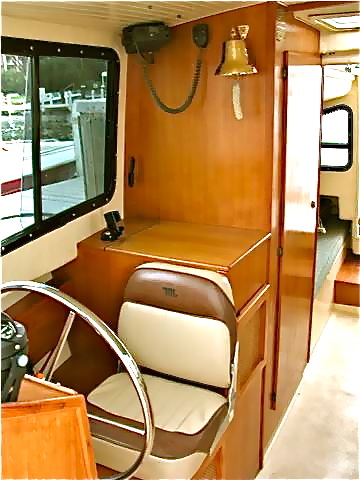 Swim ladder, anchor, lots of opening windows and hatches, stainless fittings and even bronze port holes. 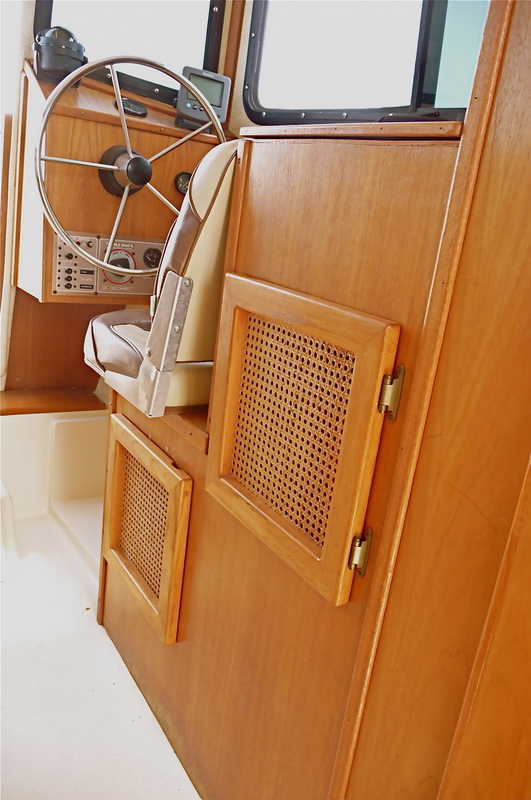 Full galley w/running water, electric stove and frig., standing enclosed head, dining table seats 4 and converts to double bunk, lounge/bunk, captain and mate chairs, full instrumentation, 6’3″ headroom, built-in seating in safe bow and stern cockpits, signal mast, etc, etc. Call 262-275-3907 or respond to this posting. 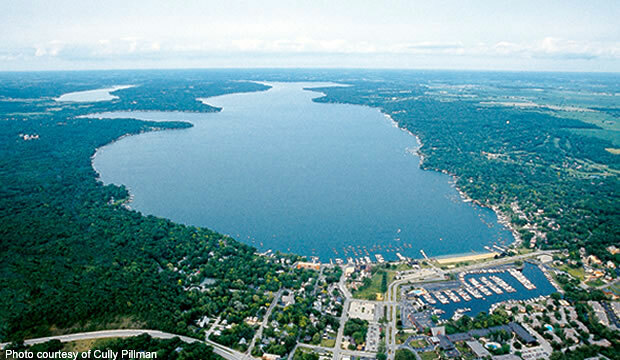 Located at Geneva Lake, WI.